The new Apple iPhone X is an excellent video camera for news and documentary interviews. But creating a very lightweight package around it can be challenging. I took the challenge and here are the results. Having, through sheer luck, gotten an iPhone X on the first day, I was impressed by the quality of its video. So much so, I retired a much larger gear package I had been using for a small over-the-shoulder bag. I can take it anywhere and easily operate as a one-man-band. After getting the iPhone X, I immediately starting searching for the smallest and best quality gear that would work well with it in a small, lightweight package. I found tons of gear — priced all over the place — from no-name companies ranging up to major manufacturers. When possible, I went with names I knew. In a few cases, I went with newcomers with fresh, innovative ideas. I began with lighting, which I bought from a new company. 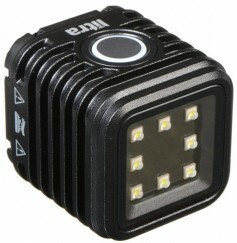 I decided on three LitraTorch LED cubes ($79.95 each). These 1.5 by 1.5-inch cubes weigh only about three ounces each. Each is the same size as the GoPro Hero5 Session camera, so they can fit in any Session mount. When you first see the Litra, you’ll do a double-take. The lights are not only tiny in size, but robust and very capable. They are adjustable for brightness, though the lowest level of 100 lumen using the included rubber white diffuser is adequate for my use in shooting interviews. These lights last up to four hours on an internal lithium rechargeable battery and can be used on AC with any micro-USB type five-volt cell phone charger. Litra builds this little light out of aluminum to 810G military spec and it can operate to 30 feet underwater. The light can be set at 800, 450 or 100 lumen settings. It features an ultra-wide beam angle to match camera wide angle formats and feature 5700k, flicker free, smooth light pattern. They come with two 1/4-20 standard camera mounts, an embedded magnet, a GoPro mount, a belt clip, a white diffuser, a silicone sleeve and a USB charging cable. Litra sells an iPhone adapter clamp for $9.95 that allows a light to be attached on the phone itself. It seems to be of high quality and works quite well on an iPhone X in a case. Next came the audio. In this case, I decided on two kinds of gear for different scenarios. 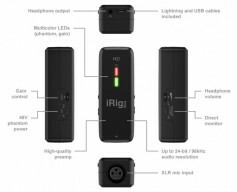 For any single XLR microphone with 48-volt phantom powering, I decided on an IK Multimedia iRig Pre HD ($99.95), which has a Class A mic preamp with an adjustable gain range of 40dB and an integrated headphone output for real time monitoring. It has a cable that plugs directly into the Lightning port of the iPhone and runs on two AA batteries. It’s very compact, sounds good and offers 24-bit/96 kHz audio. 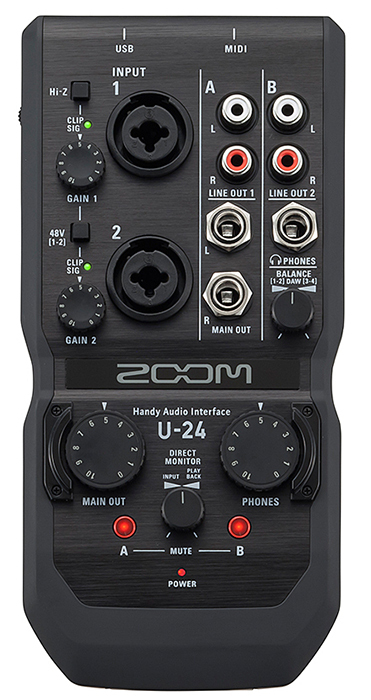 For two mic interviews, I decided on a Zoom U-24 mobile audio interface ($119.99), which also offers 24-bit/96 KHz audio in a compact two-in, four out device. It has two of Zoom’s low-noise preamps for mics, 48 volt phantom power and can also connect directly to the iPhone through an Apple UBS adapter. It also runs on a pair of AA batteries and weighs about 10 ounces. For microphones, I chose two RØDE lavaliers ($249.00), which offer low self-noise, an omni-directional polar pattern, minimal appearance and a MiCon connection system. These mics are very light in weight and are excellent for interviews. The mic capsule is connected via a four-foot shielded, Kevlar reinforced cable to a MiCon connector. I added a couple of MiCon extension cables and XLR connectors. If I need a shotgun, I use a Rode NTG3 ($699.00) with the iRig device. For a tripod, I went with something as light as possible. I purchased a Manfrotto 560B-1 Aluminum Fluid Video Monopod ($130.52) with retractable feet. It was designed to work with Mini-DV and HDV cameras in confined spaces but also handles the iPhone X. It incorporates a fluid cartridge in the base for smooth pans, and has set of retractable feet for a firm footing on uneven ground. It will support 4.4 pounds and weighs 1.9 pounds. It will stand alone with an iPhone on it, though one must be very careful not to knock it over. This Manfrotto tripod is only a temporary solution. I pledged on Kickstarter for the new Vixari Tripod, an ultra compact tripod for iPhones with extendable legs that extend to 41 inches. It includes a remote shutter and can also support 4.4 pounds. Folded down into a tiny rectangle, it is barely larger than the iPhone itself. It has far exceeded it’s goal and will ship in February. To attach the iPhone on a tripod head, I purchased a RetiCAM Smartphone Tripod Mount ($17.24), which is machined from solid aluminum alloy and holds the iPhone well. 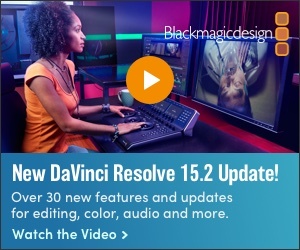 It is widely recommended by those using iPhones in broadcast production. To carry all the gear (with room to spare) I have a Domke F-2 RuggedWear Shooter’s Bag ($126.50) from Tiffen. When Jim Domke, a working photographer, designed this bag in 1975, there were few camera bags available for news photographers working the field. Virtually all news cameras in those days used film. The first one-piece video camera for news (the RCA TK-76) was a year away. To put it lightly, it HUGE and very heavy. Domke’s bag took off, sold very well and eventually he sold his bag company to Tiffen, who still makes them today. My F2 bag, that same original design, has lived far beyond it’s time. Now, I find, it is the perfect size and design for my new iPhone video package. Everything fits inside, with room for personal stuff as well. Over the years, I have learned that creating the right package for a new camera is a constantly evolving process. As you use the gear, you learn things that help refine it further. But, as far as video reporting is concerned, the iPhone X is a major step toward greater portability. It is the beginning of the pocket video revolution.